Oakland residents might be forgiven if they feel they've been watching an episode of HBO’s popular series The Wire. The summary of the Bratton Report released Thursday on OPD's crime reduction strategy contained a number of criticisms related to the department’s lack of progress in implementing the CompStat management and accountability system. A fictional version of this system at the Baltimore Police Department drives much of the narrative of The Wire. 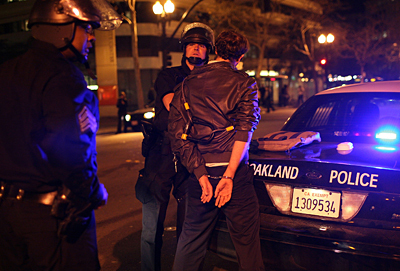 But the problems at the Oakland Police Department also appear to go well beyond the implementation of CompStat. For example, as reported yesterday, the OPD had only one part-time investigator assigned to more than 10,000 burglaries last year. Still, the issues around implementing CompStat occur in the context of a controversy that reaches well beyond the reach of even a popular cable TV series. The system originated in the New York Police Department, where it has been praised as helping reduce the incidence of serious crime throughout the city. It features weekly meetings where ranking police executives meet to devise strategies and tactics to solve problems, reduce crime, and ultimately improve quality of life in their assigned area. As part of the system, officials compile statistical summaries of the week's crimes, arrests and summons issued, as well as written reports of major cases, criminal patterns and overall police activities. All of this data is compiled into a city-wide database that is analyzed to reveal further patterns and trends. CompStat also requires weekly crime control strategy meetings based on all of the accumulated data and analysis. Representatives from the District Attorney's Offices and other outside law enforcement agencies may also attend meetings. This process is meant to promote a team approach to problem solving, and is geared to help identify solutions to persistent quality of life problems. But journalists and legal experts have increasingly questioned whether CompStat is as helpful as its proponents claim. Among the most vocal critics of is Freakonomics co-author and University of Chicago economist Steven Levitt, who argues that the program’s impact on reducing crime has been overstated. CompStat is viewed by critics as a less effective approach to crime-fighting than "community policing," where cops walk the beat and remain more in touch with what is happening on the streets. There have also been journalistic reports that CompStat may discourage some officers from filing crime reports or downplaying their significance in order to create a false appearance of a reduction of community problems.